HIMSS17 was quite an event last week… Busier and crazier than ever, with over 42,000 people in attendance, and lots and lots of miles of walking in between meetings, booth visits, educational sessions and Interoperability Showcase demos! There was a palpable sense that interoperability is not the new shiny thing anymore. It is becoming mainstream and ingrained in the minds of providers and technologists alike – which is great, and exactly what it should be in order to enable the free flow of, and access to, patient records. That being said, FHIR continued to attract the crowds as the next new shiny thing in interoperability. While FHIR’s value is undisputed in the industry, it will still take 3 to 5 years at the earliest before we see it widely implemented in the field. Until then, API companies such as Sansoro Health continue to make significant inroads against EHR vendors data blocking attempts by offering interfaces that break down data silos. APIs are rapidly changing the way business is done in healthcare – BetterDoctor, for instance, is trying to solve the thorny issue of provider data, and making it available via a set of APIs any developer can leverage. Consumerism in healthcare is truly here, and here to stay. The advent of smart phones has really led to incredible amount of innovation empowering consumers to own and drive their health destiny. The Innovation Zone showcased plenty of companies disrupting the industry, such as Lief Therapeutics, Keet Health, or Wellness Layers. Data, data and more data. Big data in healthcare has arrived. From clinical to financial and operational data, from patient socio-economic to devices-generated data, from the Cancer Moonshot to precision medicine initiatives, data is E-V-E-R-Y-WHERE! As more and more data becomes available, one challenge that is becoming increasingly evident is the abundance of quality issues in that data. Records collected from point of care systems are often times incomplete, incorrect, invalid, or not “fit for purpose”, i.e. not adequate for what it needs to be used for. At Stella, that’s a pressing issue which we are and will be focusing on over the next several years. Artificial Intelligence (AI), Machine Learning and Natural Language Processing (NLP): The exponential growth of big (healthcare) data over the last 3 years has led to an emergence of interesting technologies trying to harness the power of algorithms to detect patterns, trends, insights and other discoveries that would otherwise not be available to the human eye. IBM Watson Health is the poster child everyone’s watching grow, but there are plenty of other solution providers in the space to keep an eye out on, such as Wired Informatics. Blockchain in healthcare was the talk of the town – hands down! There even was a whole workshop dedicated to it on Wednesday… The potential for blockchain in healthcare is great (companies like Patientory have been on the forefront of it), but many technical challenges and business questions remain, as the way blockchain works is counter to how we currently do things in healthcare (see this Healthcare IT News article for more on the topic). In closing, it was encouraging to see so much activity and innovation occurring in healthcare. Given the many unknowns on the new administration’s upcoming policies and how they are going to affect the industry, it is hard to predict where those trends will go, and what HIMSS18 is going to look like. Regardless though, we ought to believe that providers and payers will continue to seek technologies that make their organizations more efficient, provide better service and care, all the while saving them – and the system as a whole – wasteful money. If they don’t, the consumers will put them to the task this time around. 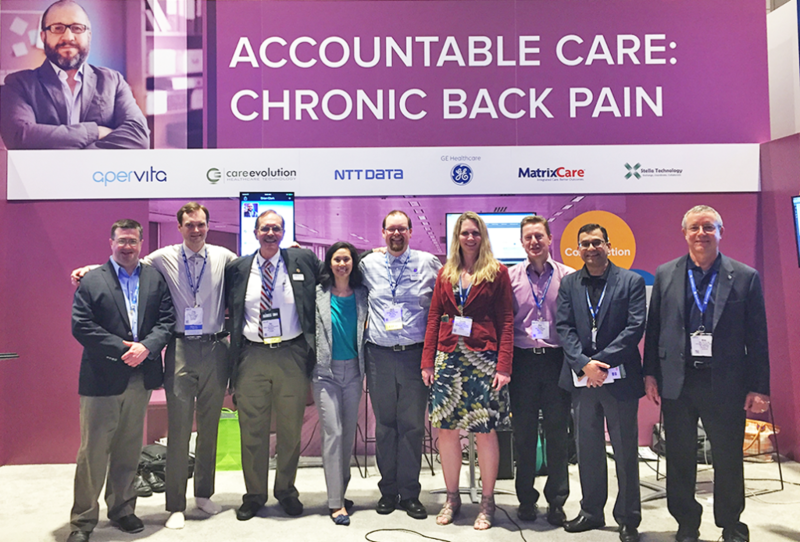 Jami Young and Corrina Burnley took part in the Interoperability Showcase, in the Accountable Care: Chronic Back Pain use case.